Six-year-olds are natural scientists, putting their biases and collected information out there, allowing you to suss out the really important questions. While at the gardens, Griffin informed me that the things we were calling turtles were really tortoises, and that the difference between one and the other ("my teacher said so") is that turtles have webbed feet. These turtles had long claws, ergo no webbed feet, and ipso facto could be considered tortoises. 1. Are the labels turtle and tortoise interchangeable, or do they refer to different types of similar-appearing reptiles? 2. If these terms refer to different classes of animals, what are the distinguishing traits of each? 3. Which label would be most correct for the reptiles we encountered this week? The animals in question...answers after the pic! Ready for the results of my interwebby research? The San Diego Zoo helpfully informed me that turtles do indeed have webbed feet and spend most of their life in or near water, including both bodies of salt water such as the ocean, as well as bodies of fresh water such as ponds and lakes. Tortoises, according to this description, are land-dwellers with stumpy feet. Period. Now, we were unable to verify the existence of webbing between the toes of our chelonian friends, but I would not describe their legs as stumpy nor their habitat as hot and dry. So we're dealing with turtles, then, right? Um. Hmmm. Doesn't that overlap with turtle a little? What gives? Wikipedia?? My good friend Wikipedia reassuringly (albeit somewhat fence-sittingly) explains that this is a matter of culture. American English tends to use the word turtle for all freshwater species, as well as for certain land-dwelling species (e.g. box turtles). Oceanic species are usually referred to as sea turtles, and tortoise is restricted to members of the true tortoise family, Testudinidae. The name terrapin is typically reserved only for the brackish water diamondback terrapin, Malaclemys terrapin; the word terrapin being derived from the Algonquian word for this animal. My confusion is purely American! These little guys, then, would be most correctly termed terrapins if you speak the Queen's English, but here in the States we Yanks are safe calling them turtles. At any rate, they are NOT tortoises. Griff's teacher is sortof/mostly right, and Griff's initial assumption that toenails are incompatible with webbed feet is most likely incorrect. At any rate, it cannot be assumed that the presence of toenails makes a creature a tortoise. 1. School mascot (and also name of the library catalog system): Testudo. 2. Battle cry: Fear the Turtle! 4. Testudines is the taxonomic order that includes turtles, tortoises, and terrapins. 5. Etymologically, it looks like maybe the word turtle derived from a French word for tortoise, which may have derived from Latin for, um, turtle? 6. Images of Testudo seem divided. The modern to-be-feared version has stumpy legs. The older sculpted version is iffy in front...BUT in back, I think he's definitely more webby than stumpy. So: is he a terrapin, a turtle, or a tortoise? Maybe you can be a turtle but not a tortoise, but not a tortoise who isn't a turtle? Think I should ask my six-year-old? 1. I finally got the chance to talk to my friend Patience about photography and other topics! She and I have had this "boy, I think we'd be good friends" vibe since meeting last fall but have never managed to get together. All it took was walking the Monument Avenue 10k with Birth Matters VA! That should be easy to repeat, right? ;) She took amazing photos (click those words, really! go look!) of us and our surroundings. I was rather disappointed in mine and she graciously suggested that I'm going through growing pains. 2. I thought she was being kind, but my angst over my struggles with the overcast day and my zoom lens made me pick up my macro (which is easier for me to learn on than the zoom, for some reason) and start asking questions. I forced myself to play with the M setting (fully manual) and it opened doors into the relationship between shutter speed and aperture. Aperture is an old friend - well, the first thing I learned after buying my macro last summer, anyway - but I've never messed with the shutter, nor felt out the interplay between the two. 3. While searching for something else, I had the idea to look up how to photograph a silhouette. Et voila, the secret. Bonus: it reminded me of the existence of the Digital Photography School site to which the last three links in this post (items #2 and #3) lead. 5. I'm trying to be less self-conscious about shooting in public places like restaurants or city streets, and about taking photos of strangers. Trying. 6. Something I read spurred me to completely reconsider my old notions about cranking up the ISO in dim lighting. I can't find it now, but did come across a cool page with photo examples. Knowledge is power, man. Defeat the grain! 7. Had a total breakthrough on April 1st regarding going fully-manual. Horrible confession: I have NEVER used my camera's light meter before. Now I'm bringing it all together. A lot of the photos I'm getting this way are AWFUL but I'm definitely learning a lot about exposure, focus, and light. 9. Also on April 1st, I received my very first invitation to a flickr group, for this photo. Squee! Two years ago at the botanical gardens, I saw a tree full of these fantastic little birds, but never could ID them. Well, the neighbor's holly tree, loaded down with berries, attracted a flock of 'em last week, and I finally figured out the right google string (songbird crest mask) and now I know, they're cedar waxwings. Pretty little things, apparently they descend on an area, pick it clean, then leave. Which is exactly what they did. The holly tree is awfully bare. Reese has been exploring number sense. Every day I see him counting things in books, ennumerating things with his fingers. We found a missing Bakugan on Thursday (which turned out not to have been dropped down the pipes or flushed down the toilet after all) and cradling his toys, he told me with sincerity, "I don't have two Bakugans, I have three Bakugans. Not two, three." He showed me the difference on his fingers. Moments later, still staring at his fingers, he said "Bakugan has three words." I looked at him, and he counted: BAH-KOO-GAHN. He did it again, with another word: MOM-MEE, two fingers peeling up. "Mommy has two." Did the kid just discover syllables, by himself, totally by chance? We talked about the "beats" in each word a few times. I mentioned the word syllable, which he thought sounded funny. Friday morning in the car, he was at it again. REE-SIE-CUP. Three. Three syllables, I agreed. Three syllables, he concurred. GRIFF-IN. Two syllables. DAD-DEE. Two syllables. KNUF-FLE-BUN-NY. Four syllables. XAN. One syllable. That afternoon, after picking up Griffin, he put his new skill to work: KRIS-PY-KREME. Three syllables. Griff, in the back seat, piped up, "what's a syllable?" I showed him with my fingers, talked about the beats, did some clapping. Reese counted some words out for him, fingers flicking up with precision. I watched Griff puzzle over it, count five syllables in KRIS-PEE-EE-KREME-UH. He will get it, but it occurred to me that we're seeing Reese's natural gifts in action here. This concept is as natural as breathing to him, he needed no teaching, only the gift of a word that describes the thing he discovered on his own. Is he an auditory learner, perhaps? Griff sees visual connections between things, started working puzzles at a young age, has always drawn series of interconnected lines and wanted to understand how things work. Reese is tapping into something else entirely, and I'm excited to see where it leads. Griff riding to deliver party invitations. The bike was a birthday present and he's quickly getting the hang of it. Dan thinks he's ready to move the training wheels up a bit. I don't remember them working that way when we were kids, is it a new thing? 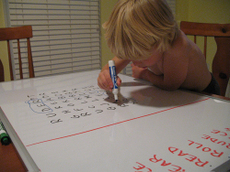 "Make me a word search," he says, gesturing toward the dry erase board on our kitchen table, "with R words." So I do. I can't say that I ever expected a child to ask me to create a word search, but then I didn't really expect Griffin, although I love that he's into this sort of thing. I would have been, too, as a kid. Ok, if you made one for me now, I would attack it with zeal.